Researchers and scholars around the globe can now freely access nearly 100 years of William & Mary scholarship online in the university’s institutional repository, W&M ScholarWorks. 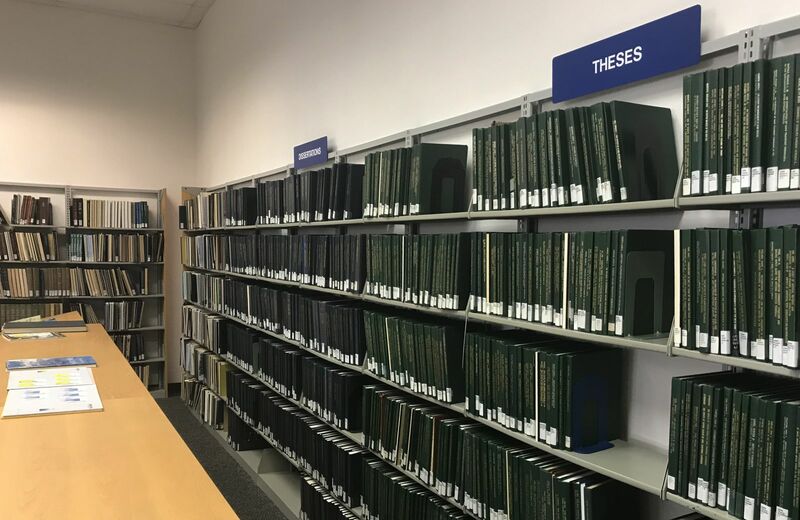 This week William & Mary Libraries placed more than 5,000 digitized master’s theses and dissertations written by W&M students, dating from 1920 to 2015, into the repository. W&M ScholarWorks serves to preserve and promote William & Mary scholarship by providing open, free access to researchers across the globe. Print theses and dissertations at the William J. Hargis Jr. Library located at VIMS. Two years ago, W&M Libraries began its project to digitize the entire print archive of W&M master’s theses and doctoral dissertations, with the goal of adding these materials to ScholarWorks. During the conversion project, every W&M thesis and dissertation dating from 1920 to 2015 was digitized; the libraries began accepting theses and dissertations in digital format in 2016. Although the university’s theses and dissertations have previously been available in ProQuest’s Dissertations Theses Global database, these materials were not freely accessible. Of those materials placed into ScholarWorks, 66 percent were master’s theses, most of which came from Arts & Sciences. Authors are allowed to opt out of having their work open to public access, but many graduates celebrated and commended W&M Libraries’ digitization efforts. 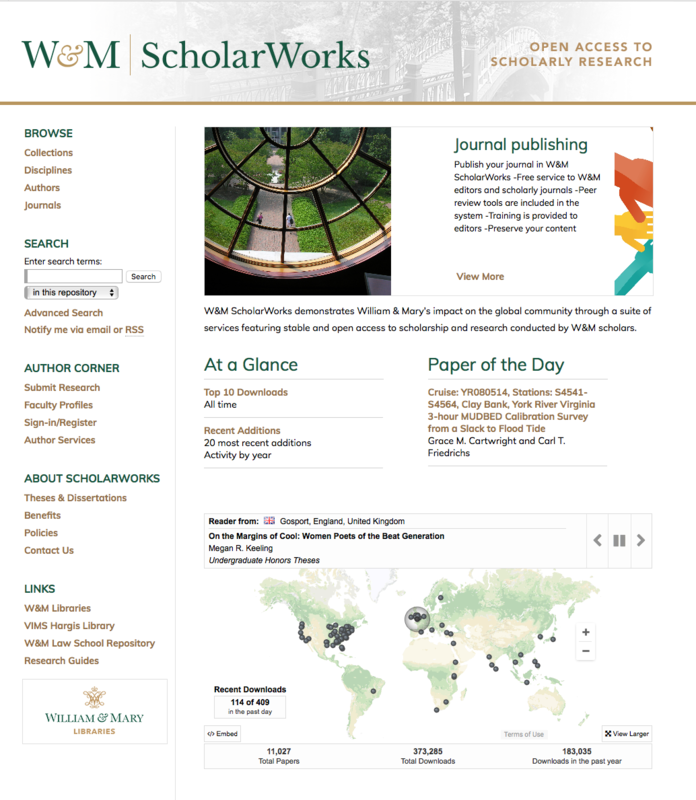 W&M ScholarWorks can host a variety of content including peer-review journals, articles, data, books, visual media and more. With its recent update, ScholarWorks is now more intuitive and visually appealing, and faculty can directly submit their materials for permissions review before posting. At the VIMS Center for Coastal Resources Management (CCRM), ScholarWorks is used to store a diverse collection of historical and contemporary publications and digital products. VIMS CCRM currently has 31 faculty, staff, graduate and doctoral students, and visiting scientists working on various coastal ecosystem and management issues and the IR allows them and other scientists to find information from all VIMS and W&M digital collections more easily. “We appreciate the flexibility offered by the repository to set up our collection how we want and need it, including recognizable logos and banners associated with our work,” said Karen Duhring, Coastal Scientist and CCRM Outreach & Training Coordinator. Each W&M faculty, staff and student author who submits to ScholarWorks retains his or her copyrights while gaining more visibility for their work. Authors also gain the ability to track the impact of their scholarship by receiving regular reports on downloads, social media mentions, and geographic location of where their work is being accessed. With most of the IR downloads currently emerging from the U.S. and U.K., individuals from across the globe and as far away as New Zealand have downloaded content from W&M ScholarWorks. The magnitude of the institutional repository and the theses and dissertations project reaches far beyond Williamsburg, Va. as W&M theses and dissertations, as well as faculty and staff works, are no longer hidden behind a paywall, but contribute to the growing global appetite for open access scholarship. This is a new opportunity for W&M graduates and the W&M community as a whole to achieve a more significant influence on global scholarship and to receive recognition for that impact. For more information about W&M ScholarWorks or open access, please visit libraries.wm.edu.